For Heidegger, the work of art is that which sets up a world and sets forth earth; “the work lets the earth be an earth” (Heidegger, “The Origin of the Work of Art,” 1936, 172). He says that the temple that sits atop a hill shows us, for the first time, the stoniness of stone. In describing a Van Gogh, he claims that we must look at paint’s color thus: “[c]olor shines and wants only to shine. When we analyze it in rational terms by measuring its wavelengths, it is gone. It shows itself only when it remains undisclosed and unexplained” (Heidegger 1936,172). The work of art is tied to the world and the earth from which is springs forth. To continue my article last month that dealt with recent sculptural works made/shown in Atlanta that exemplify this setting to work the materials found in our urban environment, I’d like to address two recent image/photography-based projects by Atlanta-based artist Stephanie Dowda. Namely, her projects Topophilia and We Are All We’ve Got. These works, in their dealings with landscape and the cosmos, we find an intricate layering of space that spans prehistoric to astronomical time. Stephanie Dowda. “Sense of Breaking Apart.” 2014. Courtesy of Get This Gallery. Dowda’s Topophilia, which gets its name from philosopher-geographer Yi-Fu Tuan‘s 1974 book Topophilia: A Study of Environmental Perception, Attitudes, and Values, consists of 14 photographic works – all 20″ x 24″ silver gelatin prints. 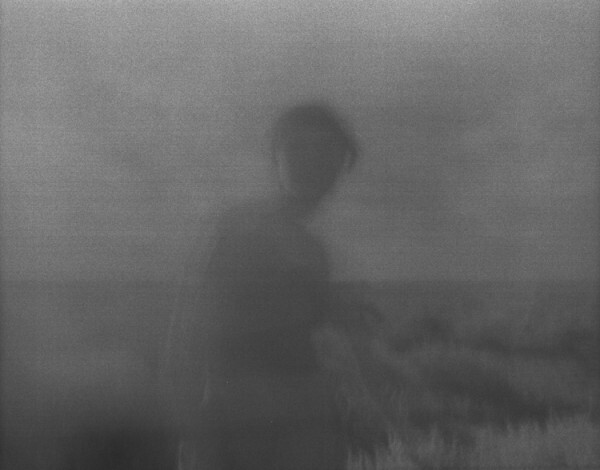 Made using an idiosyncratic medium-format camera, these soft, and often romantic, photographs are the material manifestations of energy emanations. Dowda states that the camera she uses “becomes a vessel [that] capture[s] the sensation” from and of the places she visits. 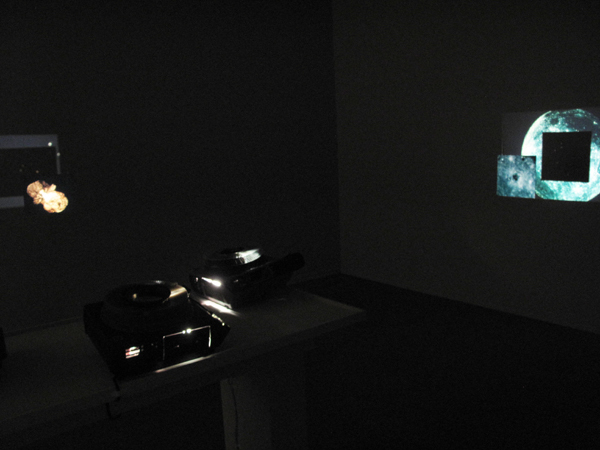 Her process involves letting the camera decide how the light waves will write themselves onto the film. Dowda claims to be taking a step back during the process of making; she lets the landscape itself create and determine the exposure. For an artist intent on photography-based practice, the camera taking over can create an uncanny sort of situation. Two of the photographs in Topophilia, Sense of Revenant and Sense of Breaking Apart, come from the Walter de Maria Lightning Field. Both of these photographs capture spectral energies – both human and nonhuman. Standing in front of Sense of Breaking Apart feels like splitting. 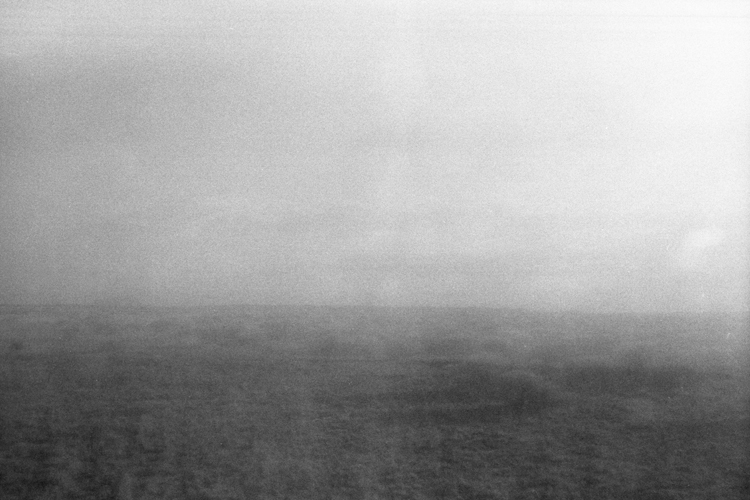 The photograph’s horizon disintegrates into the haze and so does my gaze. Without knowing where this photograph was taken, I felt the energetic pulsations of a place filled with electrical activity. Sense of Revenant combines a sense of the ghostly and the dreamy. Who is visiting this camera, filtering through its shutter? For Freud, the revenant figures as the dream visitor, a “reincarnation” of someone from the dreamer’s life and past. (Freud, The Interpretation of Dreams 1899, 523). But the revenant is also a spectre (i.e., Roland Barthes‘ Spectrum). Stephanie Dowda. “Sense of Revenant.” 2014. Courtesy of Get This Gallery. “The relation between aesthetic experience and ontological disruption is not incidental. As an aesthetic gesture in itself, the freezing of the life-world means that, what is taken-for-granted is thus shown in its transcendental givenness. This, indeed, constitutes a necessary estrangement from the world, insofar as it is precisely the everyday world in its familiar assurance that is most susceptible to sudden reversal” (2012, 26). For Dowda’s photographs, there is this freezing, but also simultaneously a putting into motion. The energetic pulsations of past lightning and the visitor pass through the shutter and make their mark on the silver of the film. These emanations reach out to the camera. However, Dowda, as photographer, reciprocates this reaching. Trigg describes how “our bodies reach out into the world, so a mimetic interplay arises, in which our sense of self becomes fundamentally entwined with the fabric of the world” (2012, 9). For Dowda’s photographs, we can see the camera as an extension of her world and thus it extends out into the world, becomes a sort of being itself. “It is temporal – human time on geologic time; contemporary notions of novelty and obsolescence on prehistoric notions of natural growth and cycles. The imposition of human habitation on the landscape is an overlay … so are the rhythms of the body transferred to the earth, those of the sky to the land or water … Artists working today from models of the distant past are consciously or unconsciously overlaying their knowledge of modern science and history on primal forms that remain mysterious to us despite this knowledge” (Lippard 1983, 3-4). The stone in the landscape carries with it a richness through its slow accumulation of history. Over time, geologic material adds to material, rock formations develop then deteriorate and change. These stones always rest underfoot. The trip, a certain kind of temporal and spatial disruption, causes us to pay attention, bring us back to the stoniness of the stone. Our bodies, composed of the same material, are inherently part of this earth. Those who were there before us are also part of this landscape. When we step on this ground, we connect to the organic material underfoot. Stephanie Dowda. “Guardian.” 2014. Courtesy of Get This Gallery. 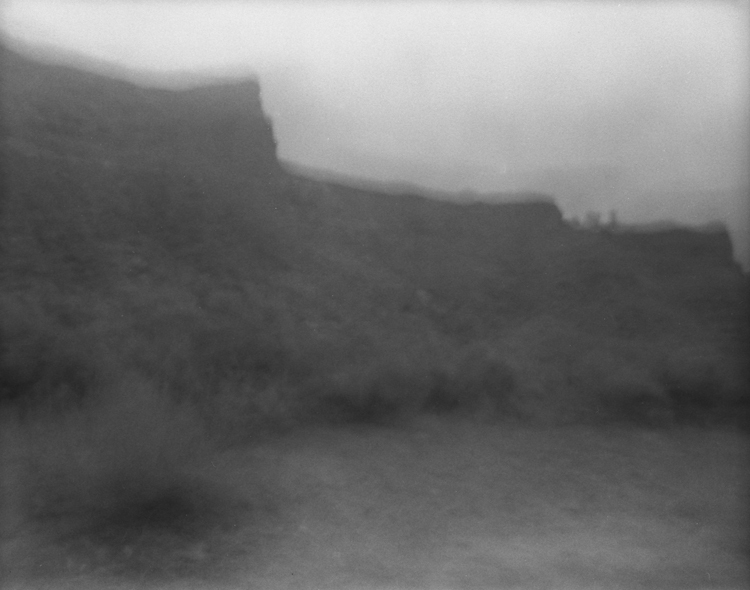 Dowda’s photograph Guardian, taken in Desolation Canyon, UT, allows us to position our present in a broader temporality, one that takes note of the years required to create a stone and what it might have meant for those before us. During Dowda’s artist talk at Get This Gallery, Dowda described the sense of protection that these rock formations of the Canyon created for her. Some sort of energy emanated from this particular geology that affected her. Incidentally, those who inhabited this area before her also felt this energy; the rock formation contains a petroglyph depicting a man who is said to be the guardian of this valley. The particular shape of the formations serve as landmarks, guiding and orienting us in this landscape. In another gesture towards spatial orientation, Dowda’s installation We Are All We’ve Got, which was installed at Emory’s Michael C. Carlos Museum for its event Veneralia, memorialized the extinct star constellations Antinous, Quardrans Muralis, and Argo Navis. Using slides culled from Emory’s Physics Department that are no longer used, Dowda projected these constellations creating a layered human orientation. These projections constitute an “overlay” of our place in this universe. Stephanie Dowda. “We Are All We’ve Got.” 2014. Courtesy of the artist. “Now we ought to think of the most sovereign part of our soul as god’s gift to us, given to be our guiding spirit. This, of course, is the type of soul that, as we maintain, resides in the top part of our bodies. It raises us up away from the earth and toward what is akin to us in heaven, as though we are plants grown not from the earth but from heaven” (90a). “What is now perceived and what is more or less clearly co-present and determinate (or at least somewhat determinate), are penetrated and surrounded by an obscurely intended to horizon of indeterminate actuality. I can send rays of the illuminative regard of attention into this horizon with varying results. Determining presentiations, obscure at first and then becoming alive, haul something out for me; a chain of such quasi-memories is linked together; the sphere of determinateness becomes wider and wider, perhaps so wide that connection is made with the field of actual perception as my central surroundings” (Husserl, Ideas I, 1913, 49). It would be too easy to deal with this uneasiness by passing it over, by claiming that there is no place that needs dealing with. I realize that the noplace of Noplaceness also gestures towards the duplicitous definition of utopia: utopia as good place and no place. However, since utopia holds within it a non-existence, it in fact is a nowhere, it is no place at all, it is the here, this place where we stand, that we must consider.